Each week on Tuesday at 4pm at The Wetlands we tap a new beer in our Ephemeral Release series. Ephemeral means short-lived, and explains the fact that these beers are, by nature, only around for a while. 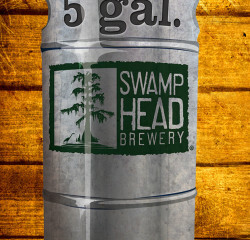 We tap one five gallon keg each week and once the keg kicks, the beer is gone. Often times these Ephemeral Releases are a way for us to test a beer that we are thinking about moving into production on the big system. Other times, these are just a way for our brewers to get creative and have some fun with a wild idea they have. Either way, these beers are a great way to get to know the behind the scenes of Swamp Head’s new and innovative beer ideas coming to life at our brewery.